I do not want to be perceived as raining on the policymakers' parade --theirs is not an easy job-- but three years after Lehman Brothers went bankrupt observers saw an adrenaline induced pop in global markets as a result of the co-ordination between the European Central Bank and others to lend dollars to banks to tame the euro sovereign debt crisis. This was nothing more than a palliative. It will not work: liquidity solutions (suitable to Italy only) do not solve the solvency problems relevant to the rest). Here are the harsh realities: the inevitability of Greece's default is nigh; Italy's sovereign credit rating downgrade heightens the risk of contagion as Eurozone based corporations increasingly look to places (other than European banks) to park their funds. Why would this happen? As Bloomberg economist Joseph Brusuelas has shown in the chart below, bank debt --in light of the sovereign holding in Europe-- poses a greater systemic risk to Europe's largest economies and Germany's "bad banks" in particular will be hit hard when Greece defaults and German taxpayers will foot the bill. 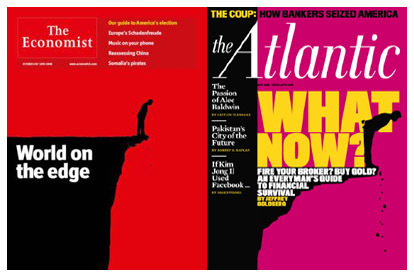 Think back to October 2008 as these vivid images coincidentally glossed the covers of The Economist and The Atlantic Monthly. Have policy makers thought out of the box in response? Arguably not much because in terms of implementation --think of quantitative easing, EFSF-- we have seen stop gap measures reliant on the notion that equilibrium will be restored in time. Amid the cacophony of noise that is the vacuous circus of business journalism, and as the summer of 2011 wound down, there have been some voices of reason espousing heterodox thought while conventional thinking has been an abject failure. What can the dead drunken german intellectual with carbuncles teach me? Yes, the ideal of communism led to political disasters --this post does not advocate a renunciation of a market economy for a top down centrally planned utopia-- but as Mark Blaug noted that Marx wrote “no more than a dozen pages on the concept of social class, the theory of the state, and the materialist conception of history” while he wrote “literally 10,000 pages on economics pure and simple.” (Mark Blaug, Great Economists before Keynes (Highlander, N.J.: Humanities Press International, 1986), p. 156. )For the uninitiated who require a 101 recap, take a look at the video of Cranfieldrapid distillation of Marx's theory of Crisis as it provides an accessible framework with which to analyze the seeds of the greatest challenge the developed economies have faced since the The Great Depression. We can all learn something about the past and prescriptions for the future. Of course, such a distillation of Capital: A Critique of Political Economy without a nuanced view of properly understanding one of the most controversial and influential figures in history irritates the true believers. As York University's Leo Panitch frames it, beyond past crisis, the uninitiated should recongize how it is that capitalism's fundamental characteristics of exploitation and alienation, class inequality and social isolation are reproduced in commodity production and market competition even in periods of capitalist dynamism, and how this too plays a role in generating both financial speculation and future crises. The takeawy here is that a capitalist system is inherently unstable over time but --for its believers-- the dynamism of the system rests on the Schumpeterian notion where there is a renewing process of transformation that accompanies radical innovation as opposed to --the perspective of capitalism's detractors-- for example the David Harvey position: "Both Karl Marx and Joseph Schumpeter wrote at length on the 'creative-destructive' tendencies inherent in capitalism. While Marx clearly admired capitalism's creativity he [...] strongly emphasised its self-destructiveness. The Schumpeterians have all along gloried in capitalism's endless creativity while treating the destructiveness as mostly a matter of the normal costs of doing business". The political economy of the current situation provides clarity in the fog of crisis: in hindsight, US President Barrack Obama should have concentrated on employment --as opposed to a watered down health care bill (known perjoratively as "Obamacare") that placated the rent seeking yet powerful insurance lobby and made no one (either on the right or left of the political spectrum) happy-- when the goodwill following eight disastrous years of George W. Bush's Presidency was palpable and --most importantly-- translatable into actionable policy when his term began in 2009. America's unemployment situation remains a disaster --best represented by the U6 rate shown above-- and will not be corrected with unimaginative supply side tinkering of payroll taxes that encourage (at the margin) corporations to hire more workers. Supply side policies work during times of stability not depressions. The many Americans that have worked in unskilled sectors will not see those jobs come back thanks to technology and corporate globalization; it is something that an increase in education and job re-training cannot remedy. The complexity of reality that requires daring thought has given way to the dogma of partisanship. The seemingly religious zeal advocating a fastrack to austerity in order to rekindle market confidence is based on the fallacy of composition equating federal government balance sheets being akin to those of households. The establishment doctrine that has dominated academic thought over the last generation promotes the primacy of monetary measures over the blunt instrutment of fiscal intervention and an adherence to free market fundamentalism. It is disappointing to see the take from the doyen of the New Classical School in a recent presentation where he implied that the government was doing too much and that "by imitating Eurpean policies on labor markets, welfare, and taxes U.S. has chosen a new, lower GDP trend." Governments have the ability to tax; households do not. Housholds do not maximize the utilities of their decisions subject to budget constraints; in a capitalist society where materialism reigns and aspirations drive purchases people think emotionally and instinctively often and rationally seldom. Governments should run surpluses during good times --i.e. not cut taxes because they are politically expedient-- when households and business sectors may over extend themselves. falling into a low growth trajectory due to highly indebted consumers and over leveraged under capitalized banks. Rekindling activist Industrial Policy is a start (though not a panacea) argue Michael Spence and Sandile Hlatshwayo in an important paper on The Evolving Structure of the American Economy and the Employment Challenge. For the hubris that remains the grand political experiment that is the Eurozone, I argued in January about the inevitability of Greek deafult and the need for formalized fiscal transfers. Greece will default, Ireland will adjust, Portugal will suffer as Spain now suffers but if Italy goes down, the eurozone will go down. Germany is right to complain after having suffered unification and no rise in real wages for 15 years via self-imposed Teutonic austerity but this is the time for german profundity to come to the fore if it believes the eurozone is worth saving for it will either pay now or pay later through an even greater crisis. On the income side, Obama's Buffet Tax is a populist small step yet the distortions in a convulted system that encourages a trickle down economics remain; this system --along with technological changes and corporate globalization-- has effectively hollowed out the middle class. It is time to throw the idea of The Great Moderation into the dustbin of economic thought and seriously revisit the orthodox notion that monetary policy trumps fiscal policy (based on reams of "intertemporal" analyses) when the Federal Reserve's own policies have done nothing to spur demand in a monetary transmission mechanism that is as faulty as that of the Chevrolet Corvair. Rethink central banking; neither the FED's dual mandate nor the ECB's inflation targeting for a non-optimal currency area are the answer. The opinions expressed are solely those of the author and not of his employer. Need a view on $CAD in 2012?